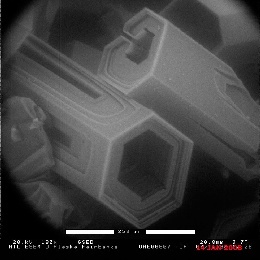 Column crystals are a dime a dozen, but the ones shown here are nicely positioned and thus unusually revealing. Although we were collecting atmospheric crystals at the time, these monsters are probably frost crystals from the dewar mouth that fell into the liquid nitrogen and contaminated the sample. The photo is by Tom Kircher at the Advanced Instrumentation Lab, University of Alaska. No wonder 46 halo is not always there. Sometimes in column displays parhelic circle is seen extending from sun outwards only for a short distance. These displays have not the sharpest upper tangent arc. Certainly structured columns have a role in these displays. Exquisite! Now we only need a perfect sample from a staggering Moilanen arc display and a few dozen photos like that. Very large crystals! Haven't seen so large crystals under microscope. These are probably not airborne originally, like Walt mentions. Stunning method this ESEM "photography".